Occasionally I spot a toy that I know I would have really, really loved when I was little. These costumes would have ticked all the boxes when I was six – a dress-up, a colouring-in activity and just the right amount of ‘princess’. 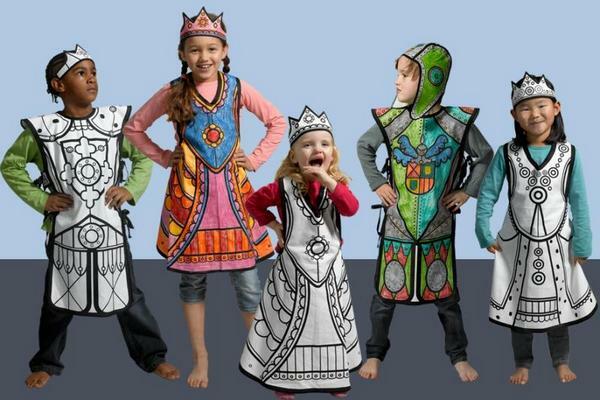 Made by Villa Carton, these costumes are inspired by medieval knights, kings and queens and come ready to be customised by the kids. There are four designs to choose from (king, queen, knight and princess) and each includes a cotton apron style costume with matching headpiece. Kids will have great fun colouring their costumes but they also have a terrific, cartoon-like quality left black and white. More designs are coming soon including a pirate, genie and nurse. Costumes are usually $33 each from Ball & Skittle but right now Babyology readers can take advantage of a two for the price of one offer for a very limited time. Enter code VillaCarton for your bargain!